Description: A delicate floral design is captured in Statuario Idalight on this stunning Smoke finished wall sconce with a curved profile. The wall fixture features the logo of Country Inn & Suites and is illuminated with high quality integral LEDs for ambient illumination and two LED lamps for functional downlighting. LEDs provide robust illumination, energy savings, minimum maintenance and long life. 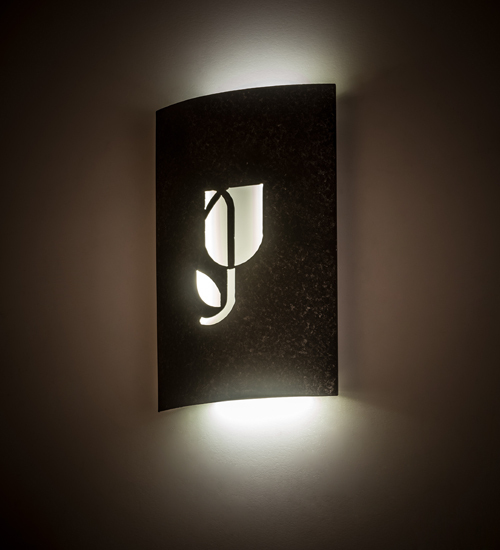 This sconce is custom crafted in our USA-based manufacturing facility where we would be Very Happy to custom design lighting fixtures that feature Your artwork, concept, logo or design. Custom sizes and dimmable lamping options are also available. This fixture is UL and cUL listed for damp and dry locations.